I recently went to NYC on the Amtrak train to help my boss set up his new Hi-Fi showroom. 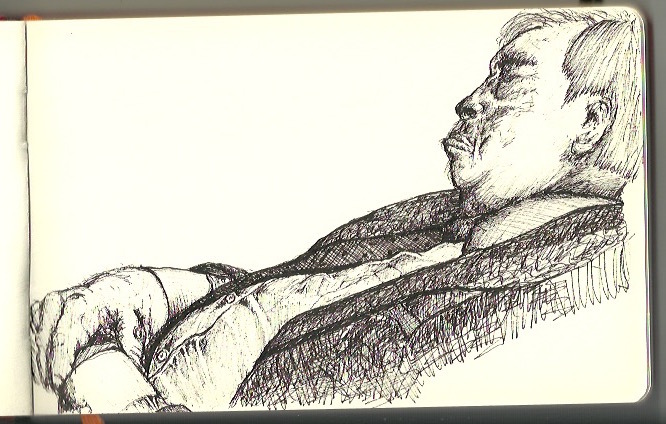 On the way there, this business man snoozed in the seat across the aisle, and I couldn’t resist sketching him. He hardly moved at all, so it was pretty easy to draw him, but I still worked quickly just in case he jolted awake. His likeness has been captured in Micron pen in my moleskin sketchbook. I hope you like him as much as I do.